"What's this?" asked the cashier at Whole Foods. "That's a watermelon radish," I replied. I couldn't believe my luck. I was in the produce section surrounded by beets, rutabagas, and turnips, when I noticed these little beauties. 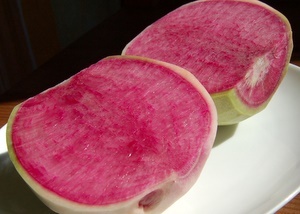 I've only had the watermelon radish once (this summer from our CSA), but I recognized its shy pink blush immediately. Could it be? I read the label and indeed -- these were watermelon radishes. I grabbed the biggest one I could find and headed home to make a salad. Once you peel your radish and cut it in half, you'll understand the name. I am sure there are tons of things you can do with this cute veggie. The only one I tried so far is slicing it paper thin on a mandolin for a salad. Sprinkled generously with salt and freshly squeezed lime juice, it's so good that it might take me a while to start exploring other ways. This one was really tame compared to the one we got this summer. I actually missed it's assertive bite, but it was still terribly yummy, particularly after all the months of winter food. If you find one with more bite than you are comfortable with, just let it sit in lime juice for 5-10 minutes. It will become much tamer. There is no recipe here since this salad is so simple. Peel and slice a watermelon radish using a mandolin or adjustable blade slicer. You want VERY thin slices, so I don't recommend doing it by hand with a knife. Add whatever other veggies suit your fancy. This time I tried regular radishes and fennel. Add some chopped herbs. I used cilantro, but mint, parsley, and tarragon would all be great. Add a very generous squirt of fresh squeezed lime juice. For a good size radish, you'll need a whole lime. Sprinkle very generously with salt. If you don't add enough salt, the flavors won't pop. No, I didn't forget the oil. You can add some if you want, but it's not necessary. Toss and enjoy. It's also good with avocado. 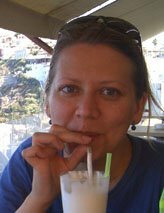 De-lurking here to ask which Whole Foods? I live near the one in Brighton but didn't see this yesterday when I was there. 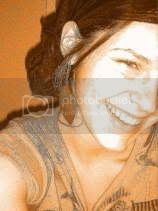 And since I'm coming out of the woodwork.....I love your blog! Someday I hope to take one of your classes. And now I'm having a hard time writing in the correct URL for my site. The link to my blog is corrected. My apologies. 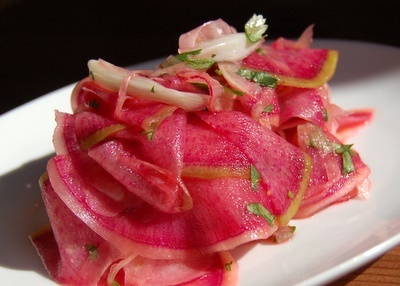 I discovered watermelon radish at a restaurant on new years eave. I was instantly hooked. Good to know it's available retail -- even if I have to search for it. Recipe or not, I'm eager to try your preparation. 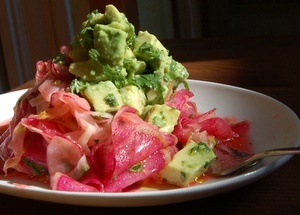 I'd never seen watermelon radish before, only 'discovered' it few days ago over at Bea's blog. It looks absolutely beautiful - I need to look out for some seeds, so I could grow my own! Welcome to Beyond Salmon. I am glad you came out of lurkdom as I learn a lot from readers' comments. I got mine at Fresh Pond Whole Foods in Cambridge. Oh funny Helen. We must have discovered it at about the same time. I blogged about it a few days ago too! Isn't it beautiful and tasty? It has become my fav radish actually. And mine came from Vermont. Thanks, Pille and Bea--I'd been wracking my brains to remember where I'd seen a post about this interesting sounding vegetable. I think I may need to overcome my hesitation about using the mandoline I bought ages ago. after all, the pink flesh of this radish should help disguise any blood loss, right? I'm wondering how it might play with a little diced mango--the colors would be stunning. Mandolins aren't nearly as scary as people think they are, especially when working with a large vegetable like watermelon radish. When you get close to the end, just stop and do it by hand. wow i've never had this veg before... im always looking for new ones. does it taste like watermelon? i can't wait to give it a go. hope my nearby WFM has some in stock! Nope, watermelon radish does not taste like watermelon at all. It's flavor is very similar to a regular radish, but it's a little sturdier since it's bigger.